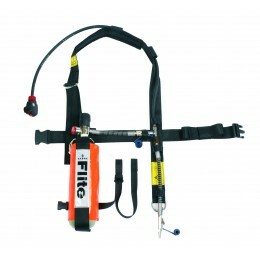 Designed for use with airline breathing apparatus, the flite set allows the user to quickly disconnect from the airline coupling and escape. Comprising tempest automatic positive pressure demand valve, supply hose and pigtail with CEN coupling, bandolier harness. Features a removable hip-mounted escape cylinder. CE marked to EN139 and EN402. This unit is supplied with a 10 minute Steel Cylinder only.